Let’s unpack this slowly, beginning with the tweet. Folks, this makes Tim Brewster’s double-exclamation-point trademark look paltry and weak. You want to know he’s talking about a city? Here’s THREE goddamn city emoji. With a check, thank you. And in case you still weren’t sure what he was referring to, there is extra clarification with EIGHT pointing fingers and THREE arrows. ELEVEN total indicators. Eleven players on a football unit. Coincidence? No, genius, I say. Cap it off with the holy trinity of hashtags (including “That 512 Lifestyle,” which presumably has a variety different meanings to a wide spectrum of people, and that’s okay!). That’s all well and good, because the true beauty of this tweet lies in the graphic. 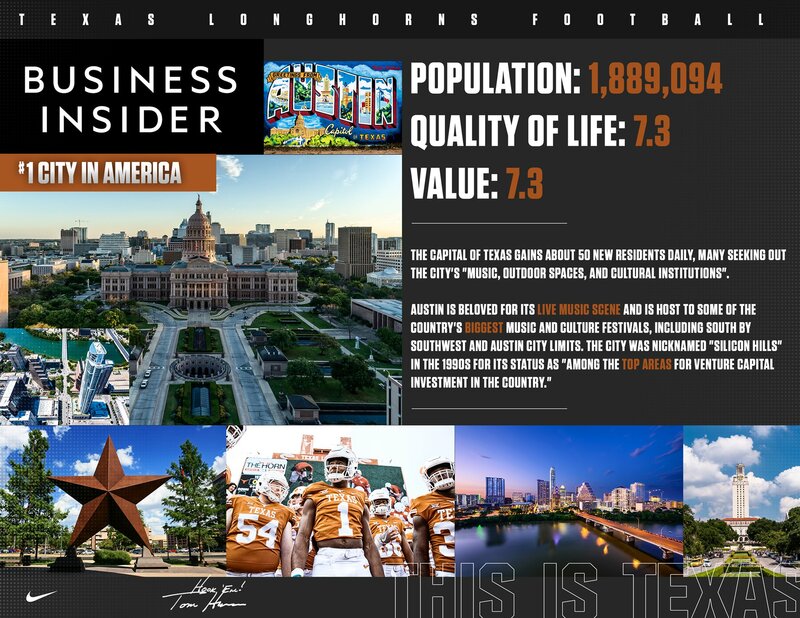 #1 CITY IN AMERICA, BUSINESS INSIDER. Folks, if you don’t believe this is a keep-up-with-the-Joneses response to Texas A&M Football social media marketing, I don’t know what to tell you. NO ONE in college football is more obsessed with #Business. This is a clear effort to nudge in on that rich market of #Business-oriented blue-chip recruits that we’ve been freely harvesting unimpeded now for years. It’s shrewd, if a bit lacking in subtlety. But when did being subtle ever win at #business? You simply cannot argue that Austin is the #1 city in America, because Business Insider has declared it so. POPULATION: 1.89 MILLION. And every single one of them is on I-35 heading to San Antonio or Dallas every Friday at 4 p.m. AMIRITE? Wow. According to the 2016 U.S. Census (via Wikipedia) the population of Austin is about half that. We knew it was growing, but holy hell! We know, we know. It includes the “greater metropolitan area,” whatever that means. But hey: if you want to gerrymander Round Rock, Williamson County, and the complete, engulfing hellscape of suburban tract housing and drab corporate office parks that surrounds Austin just to inflate your numbers, it’s somewhat disingenuous to tout a weird indie culture as a major selling point. Internet! Can’t argue with these figures. You whip up a fancy graphic and slap some big block numbers in there, it’s impressive as hell no matter what it says, even if it’s completely devoid of context or meaning. We’ve been doing it on THE TAILGATE now for years. Y’all, we have it on authority that this quote comes direct from Tom Herman himself! This is his triumvirate of selling points; the first three facets of the program that he markets in every in-home visit he makes with recruits’ families. As for the 50 new residents, I’m going to be That Guy who embeds his own tweet in a post here because I’m too lazy to come up with a new taek or even completely retype this one. “Silicon Hills” sounds like a cheap Red Shoe Diaries spinoff that would air on Showtime at 12:15 a.m. on Sundays in 1997. “Silicon Hills,” the only retirement community exclusively for exotic dancers. Watch “Silicon Hills” on BravoTV! this fall, Wednesdays at 10 p.m. This story originally posted at https://www.goodbullhunting.com/2018/2/28/17061724/longhorn-ol-coach-herb-hand-wants-you-to-come-to-the-greatest-city-in-the-world by College BattleGround.